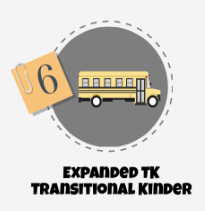 LAUSD will be expanding its Transitional Kindergarten (TK) Program to assist children impacted by the shuttering of its current SRLDP preschool program, by creating an Extended Transitional Kindergarten program, now acronymed as ETK. 117 school sites will offer the program beginning in August 2015, with the remaining 173 sites opening in the 2016-17 school year. There will now be 3 distinctions of the entry-level programs. Kindergarteners who meet the 5 by Sept 1st age cut-off will enter Kindergarten (K). Students whose birthday falls between Sept 2 and Dec 2 have the opportunity to enroll in the Transitional Kindergarten (TK) program, and those children whose birthday is after Dec 2 and who quality will be placed in the Extended Transitional Kindergarten (ETK) program. All of these programs are a tuition-free, full 6-hour day following the same schedule as other elementary school classrooms, with Breakfast In the Classroom (BIC) provided. Class size will be limited to 24 students per class. 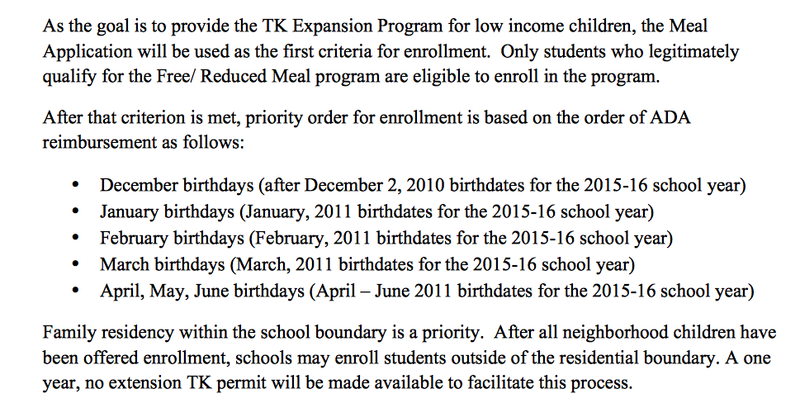 Priority enrollment for ETK will be offered to low income high needs children who have missed the 5 by Sept 1st Kindergarten age cut-off and have also missed TK’s current 5 by Sept 2-Dec 2 cut-off. This is a preschool program that focuses on school readiness and language acquisition with the intention of preparing children for Kindergarten. Only those students who legitimately qualify for the Free/Reduced Lunch Meal Plan (FRLP) will be eligible for ETK and then those applicants will be taken in order of birthdate beginning in Dec and continuing through March 31 and possibly into April, May or June if space is available. Families residing in the school attendance area will also be a priority. Schools may offer a 1-year non-renewable TK/ETK transfer to non-residents after satisfying all other priorities first. I get asked about the new STEM focused Playa Vista Elementary School often in my talks and consultations. If you are interested in applying to the school, please find enrollment info below. As it is a neighborhood school, priority is given to those residing within the school’s attendance area. For non-residents, Wait List begins THIS FRI, Feb 1st, 2013 at PVES Main Office (open 7am-4pm)…first come, first served. K Eligibility: Children must turn 5 on or before Oct 1. Please pick-up an enrollment form at the PVES office as soon as possible and return forms on registration day. If you do not have your child’s physician card completed, you may turn in enrollment forms and bring your child’s immunization record (original and copy) and submit the physician card at a later date. 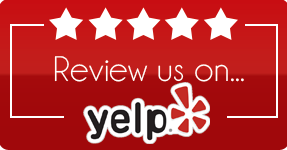 Please bring the following documentation with you to pick up a form. Permits will be released based on available space and in order of the wait list. To be placed on the wait list, please visit the office on or after February 1st (M-F, 7am-4pm). First come, first served. Permit applications will be available starting April 15th. Questions? Contact the school office at 424-228-1800. This topic has come up several times this week at my talks, plus it was also an “Ask Tanya” question on my FB page (thanks Susan!) so it begs to be outlined again. With the passing of Senate Bill 1381, also known as The Kindergarten Readiness Act of 2010, the Kindergarten age cut-off will be changing over a three year period beginning next fall. Currently a child must turn 5 by December 2 in order to be eligible to enter Kindergarten that year. 5 by September 1 for 2014 and all subsequent years. This will line California up with the majority of other states across the country. What this also means is that while we transition to the earlier cut-off, there may be current preschoolers with fall birthdays who will just miss the new age cutoff by a few weeks, catching parents by surprise. For those children impacted by these changes, you will have the option of staying another year at your preschool, finding a school that offers a Developmental Kindergarten or DK (some charters and private schools offer this, sometimes it’s called “Preppy K”), or enroll your child in one of the LAUSD Transitional Kindergartens or TK programs established by the new law. There are about 38 schools piloting a TK program this year at various school sites across LAUSD. It is expected that the number of TK programs will jump to 100 in 2012, and swell to more than 500 by 2014, the year of full implementation. The TK program is designed to offer Kindergarten content at a slower-pace for those children with late summer, early fall birthdays who, for a variety of reasons, are ready to go to school but who might not be ready for the full-paced curriculum of a traditional kindergarten. It will support a foundation of successful learning and offer preparation for Kindergarten. Giving children the “gift of time” in a two-year Kinder program allows the child another year to mature socio-emotionally, physically, developmentally and ease into the rigors of today’s Kindergarten expectations. Schools opt to pilot a TK program if there is demand and adequate staff. Being a new program and managed site by site, much is yet to be determined regarding the overall quality and consistency of these programs, nonetheless it will be an option to consider as part of the new law. For further information contact Ruth Yoon, LAUSD Administrator, Early Childhood Education at 213-241-4713 or ruth.yoon@lausd.net for a list of participating TK schools. Tanya Anton is the creator/founder of GoMamaGuide.com helping parents demystify and navigate their public school options in Los Angeles. To read more articles by Tanya or to learn about her Guidebooks, House Chats, Consultations, and popular Seminars, visit GoMamaGuide.com or email us at GoMama@mac.com. © 2011 by Tanya Anton, GoMamaGuide.com All Rights Reserved. Get Savvy on College Funding with SmartTrack! Heads Up! ECHOICES Deadline Extended One More Week To Friday Nov 16 5p! eChoices Deadline This Friday, Nov 9 at 5p! Will There Be A Strike? What Happens Then? Heads Up! SAS Now Included in Oct/Nov EChoices App! GoMamaGuide Launches New “LUNCH & LEARN” WEBINAR Series! First Day of School 2018! Last Chance for eChoices/Magnets TODAY!